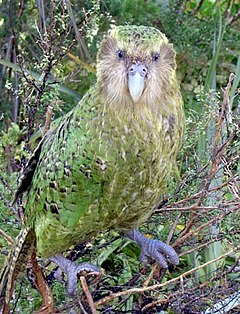 The kakapo (Māori: kākāpō or nicht parrot), Strigops habroptila (Gray, 1845), an aa cried houlet parrot, is a species of lairge, flichtless, nocturnal, grund-dwellin parrot o the super-faimily Strigopoidea endemic tae New Zealand. ↑ BirdLife International (2013). "Strigops habroptila". IUCN Reid Leet o Threatened Species. Version 2013.2. Internaitional Union for Conservation o Naitur. Retrieved 26 November 2013. ↑ Best, H. A. (1984). "The foods of kakapo on Stewart Island as determined from their feeding sign" (PDF). New Zealand Journal of Ecology. 7: 71–83. Retrieved 15 January 2016. This page wis last eeditit on 4 September 2017, at 02:50.